In fantasy football, it’s easy to know that LeVeon Bell is a better fantasy running back than Danny Woodhead. It’s easy to know that A. J. Green is a better fantasy wide receiver than Stefon Diggs. When comparing players against others in their position groups, it’s fairly straight forward to know who is better; you can just go off of point projections. But we all know in fantasy drafts, you don’t draft all the running backs until everyone fills their roster, and then all the wide receivers next, and so on. Every position grouping is fair game right from the start, so difficult decisions must be made throughout your entire draft. So it’s the middle of round 1, and you have to compare LeVeon Bell and A.J. Green. Who should you take? Or let’s say now you’re in a middle round of your draft and it’s your pick, and you need a flex player. You are comparing Danny Woodhead and Stefon Diggs…who has the better VALUE in this spot. For the simplest example, think about having the 1st pick in a 2 team draft, with only the following 4 players available. Who do you draft with the 1st pick? First instinct is obviously to draft WR #1 with the 1st overall pick because he has the highest overall points projection, however, the falloff from WR #1’s projection to WR #2’s projection is only 5 points. There is a far greater gap (40 points) between RB #1’s value and RB #2’s value. What does that mean? It means that with the first pick, you should take the greater value (RB #1) because your 2nd pick can go towards WR#2 for nearly the same value as WR #1. It means that with the first pick, you should take the greater value (RB #1) because your 2nd pick can go towards WR#2 for nearly the same value as WR #1. By implementing the Value-Based Drafting theory, you gained a 35 point advantage over these 2 rounds. Using this theory to fill your entire roster helps to squeeze every bit of value possible out of your draft and put you well on your way towards the fantasy playoffs. 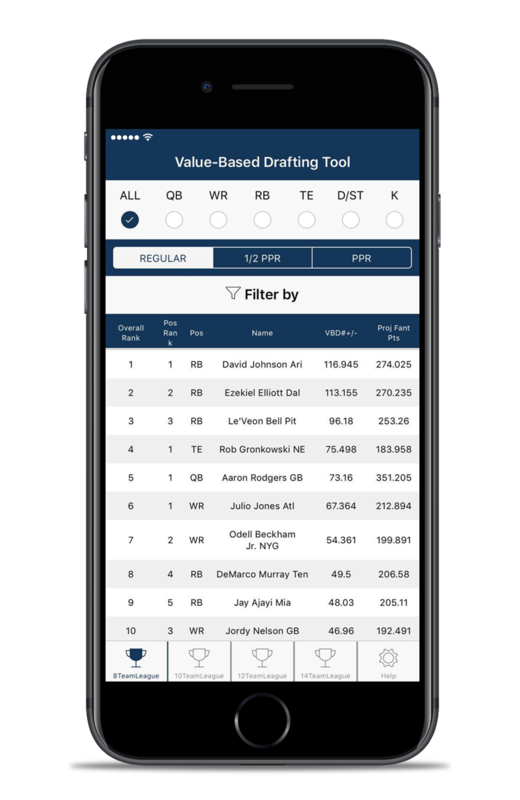 Our Value-Based Drafting Tool applies this principle to every possible player/position to help you WIN YOUR DRAFT! Coming out of your draft with the most possible value is the single best way to prepare you for success when the season starts.